Blake Shelton does not play when it comes to his personal life. 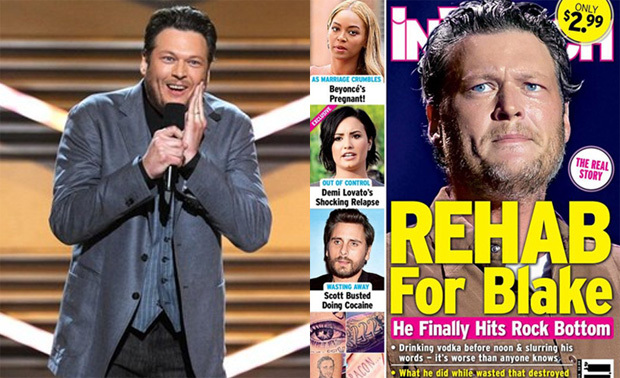 In Touch magazine owned by Bauer Media that is known to stretch the truth a bit reported on their cover that Blake checked into rehab after his split from Miranda Lambert. Problem is though that according to Blake this is the second time the magazine has straight out lied about him and he did no such thing and is now suing the magazine for millions. No word yet from In Touch Mag on the suit for providing false accusations against the country music mega celeb. [UPDATE] – Showbiz Spy sources have confirmed the magazine has been in touch with Blakes attorneys in an effort to settle the case. The attorneys though laughed at the settlement amount of around 500k and said that 2M is what they are requesting or the issue will go to court and the magazine will end up payng the 2m plus attorney fee’s.